The social web can help transform your traditional approach to conversion funnels. Social media tools enable you to turn your customers into megaphones for your brand. Traditional approaches to online sales seek to draw as many customers as possible into the top of your funnel and then focus on optimising the sales funnel to maximize the numbers coming out the other end. Strategies to pile the volumes into the top of the funnel typically rely on expensive marketing approaches that are focused on critical mass. 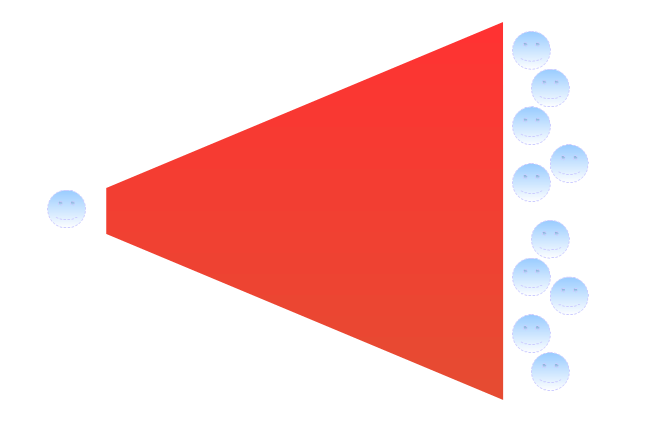 Since the funnel can only be optimised so much, the imperative is to push as many into the top as possible. But isn’t there something terribly frustrating with losing ninety-nine out of every one hundred customers that come to you? 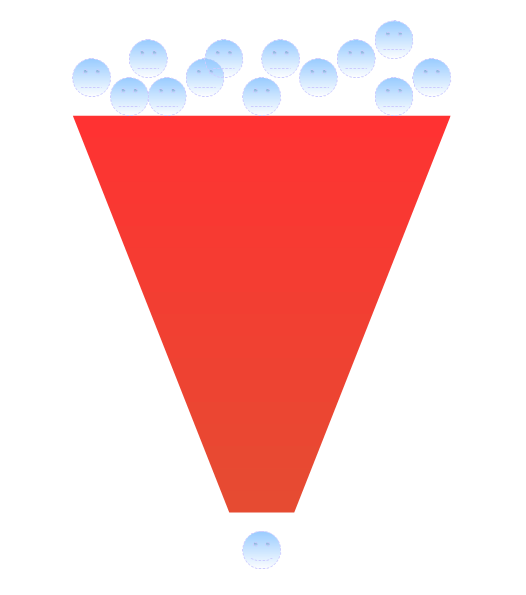 The traditional conversion funnel, with volumes driven by expensive marketing. Hot Sharing – Forget hot leads and focus on hot sharing. At the point when your customer is happiest with you, provide them with easy to use tools enabling them to share their positivity towards you with their friends. Only you will know what a happy customer looks like for your business. Leverage all of the social tools that exist to enable them to tell the world about you. This type of word of mouth endorsement will be far more effective than all of the advertising that you might pay expensive agencies to create for you. Reward Positivity – If you want to encourage positivity and sharing, reward it. Your happy customers will do it anyway but by showing them that you appreciate it, more of your happy customers will be likely to do it. Find appropriate rewards that suit your product. Give them discounts. Give them increased profile. Or maybe just say “Thanks”. Engage with Your Biggest Critics – Believe it or not, your biggest critics can often become your biggest fans. Vocal critics online can have a damaging effect on your reputation. Often these are happy customers that have been turned by something in your processes into frustrated unhappy customers. Where they have legitimate reason to be annoyed, engage with them and show them that you are listening and attempting to fix the problem. There are so few businesses doing this in an authentic manner, that you might be surprised at the positive response you get. Where they are being unreasonable, your reasonableness will become very obvious to everyone else who is watching the conversation. Stop spending a fortune dragging those thousands or millions of customer into fundamentally inefficient funnels. Spend time making it easy and interesting for your happy customers to become megaphones for your business. Have you heard Joe Jaffe talk about flipping the funnel? Checking him out now. Thanks.